The Cheenese Fowk's Liberation Airmy (PLA; simplifeed Cheenese: 中国人民解放军; traditeeonal Cheenese: 中國人民解放軍; pinyin: Zhōngguó Rénmín Jiěfàngjūn) is the airmed forces of the Fowkrepublic o Cheenae (PRC) and Communist Pairty of Cheenae (CPC). The PLA conseests o five professional service branches: the Ground Force, Navy, Air Force, Rocket Force, an the Strategic Support Force. It an aa haes a militia service branch, the PLA Militia. The PLA is the warld's lairgest meelitary force, wi a strength of approximately 2,285,000 personnel, 0.18% of the kintra's population. It is the fastest modernising meelitary power in the warld, wi significant defense projection capabilities. Recently, it haes been rapidly developin and commissioning new arsenals, wi numerous technological advancements and breakthroughs. It boasts the seicont lairgest defence budget in the warld, awtho mony authorities – includin SIPRI an the U.S. Department of Defense – argue that China daes nae report its real level of military spendin, which is allegedly much higher than the offeecial budget. In September 2015, Xi Jinping, the General Secretary of the Communist Pairty of Cheenae an the commander-in-chief of the PLA, annoonced a reduction of the number of meelitary personnel by 300,000: frae 2,3 tae 2 million. 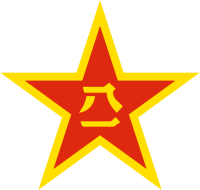 The PLA's insignia consists o a roundel wi a reid starn bearing the Chinese characters for Eight One, referring tae the Nanchang uprising which began on August 1, 1927. The PLA is unner the command of the Central Meelitary Commission (CMC) of the CPC. It is legally obliged tae follae the principle of ceevilian control of the military, awtho in practical terms this principle haes been implemented in sic a wey as tae ensure the PLA is unner the absolute control of the Communist Party of China. Its commander in chief is the Chairman of the Central Meelitary Commission (uisually the General Secretary of the Communist Party of China). The Ministry of National Defense, which operates unner the State Council, daes nae exercise ony authority ower the PLA and is far less powerful than the CMC. A seestem of poleetical officers embedded within the military ensures party authority ower the armed forces sae that the primary role of the Ministry of Defense is that o a liaison office wi foreign militaries rather than a commanding authority. The poleetical and military leadership hae made a concerted effort tae creaut a professional military force, the duties of which are restricted tae national defence and tae the provision of assistance in domestic economic construction and emergency relief. This conception of the role of the PLA requires the promotion of specialised officers who can understand modren weaponry and haundle combined arms operations. Units aroond the kintra are assigned tae ane of five Theater commands by geographical location. Military service is compulsory by law; houiver, compulsory military service in China haes never been enforced due tae lairge nummers of military and paramilitary personnel. In times of national emergency, the People's Armed Police an the People's Liberation Army militia act as a reserve and support element for the PLAGF. The PLA on 1 August 2017 merked the 90th year anniversary syne its establishment, afore the big anniversary it mounted its biggest parade yet an the first ootside of Beijing, held in the Zhurihe Training Base in the Northern Theater Command (within the Inner Mongolia Autonomous Region), the first time it haed ever been done tae merk PLA Day as past parades haed already been on 1 October, National Day of the PRC. A Chengdu J-20 5t generation stealth fighter currently unner development for the PLAAF. ↑ 2.0 2.1 2.2 2.3 "Military Strength of China". Globalfirepower.com. Retrieved 2011-04-01. ↑ "Chinese Military Overview". SinoDefence.com. Retrieved Aug 17, 2012. ↑ "China Boosts Defense Spending as Military Modernizes Arsenal". Bloomberg. 5 March 2013. Retrieved 30 April 2013. ↑ "Source". Sinodefence.com. Retrieved 2011-04-01. ↑ "China / Aircraft / Jianjiji / Fighter". GlobalSecurity.org. ↑ Gertz, Bill (7 November 2016). "Report: China's Military Capabilities Are Growing at a Shocking Speed". The National Interest. The National Interest. ↑ China's defence budget. "Deciphering China's latest defence budget figures | SIPRI". www.sipri.org. SIPRI. ↑ "DoD Report: China's Military Investments Continue". U.S. DEPARTMENT OF DEFENSE. U.S. Department of Defense. ↑ Edward Wong; Jane Perlez; Chris Buckley (2 September 2015). "China Announces Cuts of 300,000 Troops at Military Parade Showing Its Might". The New York Times. ISSN 0362-4331. Retrieved 3 September 2015. This page wis last eeditit on 1 Julie 2018, at 14:25.